Protest against Bolsonaro in Cuiabá. Wikimedia Commons. The street parties of the world’s biggest carnival might be one of last places you’d expect to find feminists mobilising against political repression. But Brazil’s Rio Carnival – this year especially – was used by the country’s strong and growing feminist movement as a platform for calls to action against what clearly is an all-out assault on women’s and gender rights in Brazil. Early last month, on International Women’s Day, some 50,000 women gathered to march in the commercial capital, São Paulo, with another 50,000 in Rio de Janeiro and thousands more in other smaller rallies across the country. Less than a week later, women led more than 50 events in a show of resistance, marking the first anniversary of assassination of human rights activist and Rio councilwoman Marielle Franco. These actions were part of a campaign of activism that did not start recently but was certainly reinforced by last year’s election campaign that led the misogynist, racist, right-wing politician Jair Bolsonaro becoming president. As with all Brazilians seeking an inclusive, just democracy where their rights are upheld and protected, women have a challenging battle to wage against the intentions of the man dubbed Brazil’s Donald Trump. Bolsonaro’s anti-rights views and proposed policies, his shameless distortion of truth and his baseless and chaotic decision-making process are serving to deepen the divide in a society navigating a crisis of multiple dimensions including political, economic, social and environmental. The exclusion of women remains a major challenge. We lead in many areas of work – excelling in academia, with 72% of scientific articles authored by women, more more graduate than men university – but not fully included. Women still lead in informal employment, the care economy and services but are paid only 80% of the wages of a man in the same position. Even with unfulfilled rights, women’s growing independence is not being accepted by men. But the current administration seems deaf to any calls to respect and protect rights of women. Recently, at the UN’s annual Commission of Status of Women meeting, the Brazilian government shamefully supported the exclusion of mentions to universal access to sexual and reproductive health rights in the closing document, claiming it would pave the way for the “promotion of abortion”. In the same election that took Bolsonaro to power, female representation in Congress rose to 51% and to 35% in State Assemblies. So, despite these obstacles, it is particularly encouraging that feminist thinking and impact is growing, especially among young Brazilian women. We’re seeing it in political office. In the same election that took Bolsonaro to power, female representation in Congress rose to 51% and to 35% in State Assemblies. It is still a small number of women representatives – just 12 senators, 77 Congresswomen – in a country where more than half the population are women. This wave of change was highlighted in the State of Civil Society 2019, a report by civil society alliance CIVICUS that reviews the events and trends that impacted civil society worldwide in the past year. The report pointed to a few historic firsts: the first-ever election, of an indigenous woman to the Brazilian Congress – in the same electoral process that brought Bolsonaro to power, for one. Joênia Wapichana, a defender of land and indigenous peoples’ rights, stands up for the environment against powerful agribusiness interests. Also, the state of Bahia, with a majority Afro-Brazilian population elected the first black woman, Olivia Santana, as its state representative. In São Paulo, voters named a trans woman, Érica Malunguinho, as one of their state representative – another first. And while no little progress has been made in the investigation of Marielle Franco’s assassination, three of her colleagues were elected as state representatives in Rio de Janeiro, and a fourth to the National Congress. But women are occupying spaces and driving change beyond electoral politics. As it did in the United States after Donald Trump’s election, the hostile environment is also fuelling women’s organizing in Brazil. Countless formal and informal groups have been created to protest, organize, debate, learn and support women in a moment of vicious attack on their rights. During last year’s presidential race, the Facebook group “Women United Resist Bolsonaro” garnered almost four million supporters in a matter of days and sparked hope that his lead in the polls could be reversed. 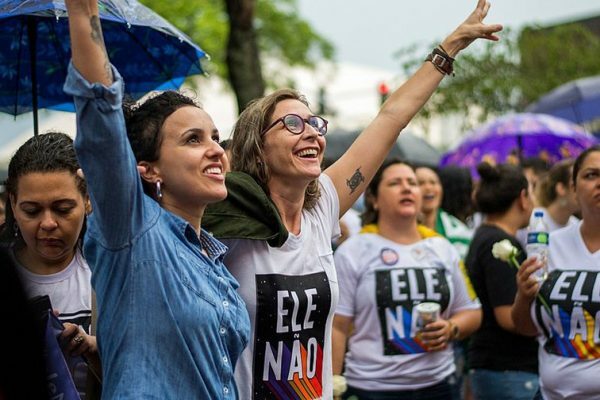 The powerful campaign to occupy public spaces, squares and transit terminals, and engage voters about the dire implications of voting for Bolsonaro was among the potent experiences that fuelled the formation of women’s groups online and offline, in Brazil and abroad. What drives this women’s movement in Brazil is the understanding that rights that have been already secured and guaranteed can be easily reversed, as evidenced in the growing threats to sexual and reproductive rights. And as the anti-rights administration rolls into its four month, women continue to show up for social justice and human rights, leading crucial protests across the country. The current austerity proposal for pension reforms is being met with resistance by women that understand the burden of the lack of state funding for social services. What drives this women’s movement in Brazil is the understanding that rights that have been already secured and guaranteed can be easily reversed, as evidenced in the growing threats to sexual and reproductive rights and the impunity in the alarming number of violent attacks on women. Women’s motivation is that rights need to be defended constantly, otherwise they are at risk, even in moments where it feels like a victory. Brazilian institutions are not strong enough for women to claim lasting victories and rest easy. This used to be true only for the Global South but times have changed and this seems to be a growing worldwide trend. So, encouraging progress in the struggle for women’s rights has to be backed up by constant action for dignity, equality and justice for women of all classes, colors and backgrounds. It’s important we recognise, globally, that this struggle is intersectional and international, and it requires connecting all strategies broadly to go beyond just giving equal access to women and girls in society, but calling “for a radical transformation of society based on the twin principles of equity and justice”.